Relax in the shade with this 7-1/2 ft. Push-Up Patio Umbrella. Hexagon shaped with polyester weather resistant canopy fabric to protect against fading, the steel umbrella pole snaps into place for quick and easy setup and has a push-up mechanism to deploy the gray canopy. Sturdy and strong with a 1-1/2 in. Dia center pole and ribs, use with an umbrella base or a table with umbrella hole (both sold separately). Caspian 8 ft. x 10 ft. Rectangular Market Umbrella in Stone Olefin The Caspian 8-ft x 10-ft Rectangular Market Umbrella provides a large shade area for your patio space, perfect for oval and rectangular tables. The push-button tilt adds longevity to your umbrella by separating the tilt feature from the handy open/close crank feature. Simply crank open the canopy and push a button to tilt the canopy to obtain your desired shade. 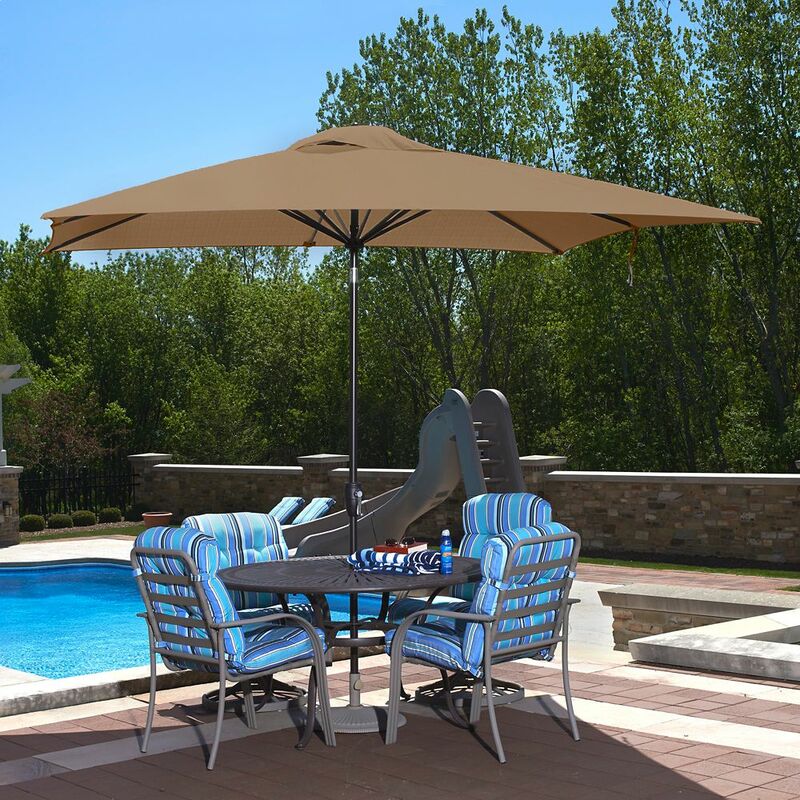 The strong anodized-aluminum pole and 8-rib canopy structure are elegantly finished in a rust-resistant powder-coated bronze color. The durable weather and fade resistant Olefin fabric canopy sports a single wind vent that allows air to escape freely to limit wind damage. The Caspian is beautiful, stylish, and built to last! Olefin fabric canopy backed by 2 year warranty; 3 year warranty on pole and structure. 80-lb base recommended (sold separately). Caspian 8 ft. x 10 ft. Rectangular Market Umbrella in Stone Olefin is rated 3.6 out of 5 by 23.